This old jewelry box is one that I NEVER would have picked up a few years ago. 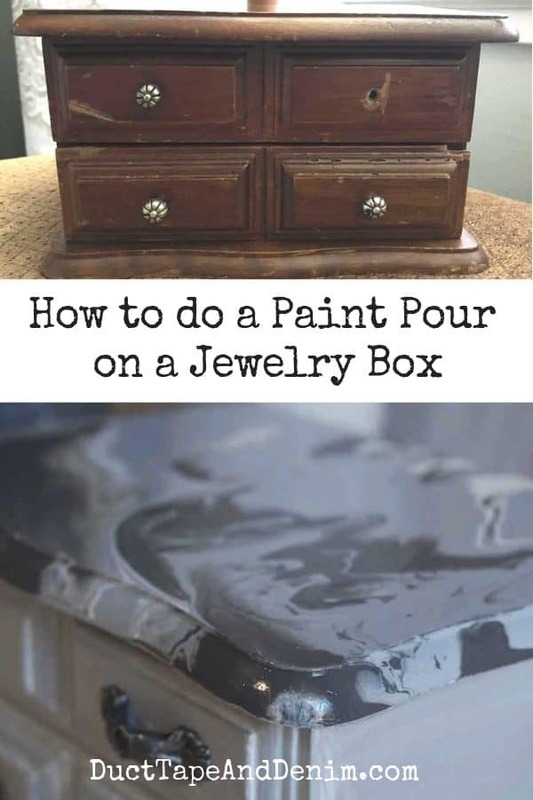 I thought painting jewelry boxes was boring! But then I started stenciling them. 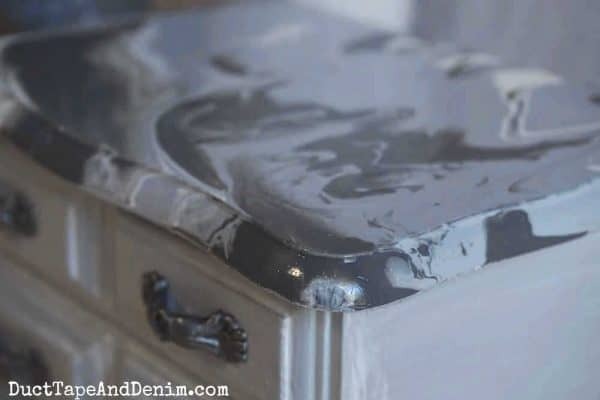 Now I’ve done a few paint pour jewelry box projects and I’m hooked. 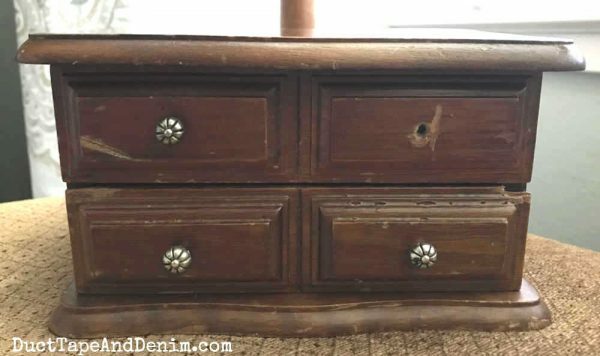 One great thing is that these jewelry boxes are usually CHEAP. Especially when they’re missing a knob like this one was. I paid $3 for it. Sign up for our newsletter & get your own printable list of “25 Things You Should ALWAYS Buy at Thrift Stores” + all our upcycled projects sent straight to your inbox. 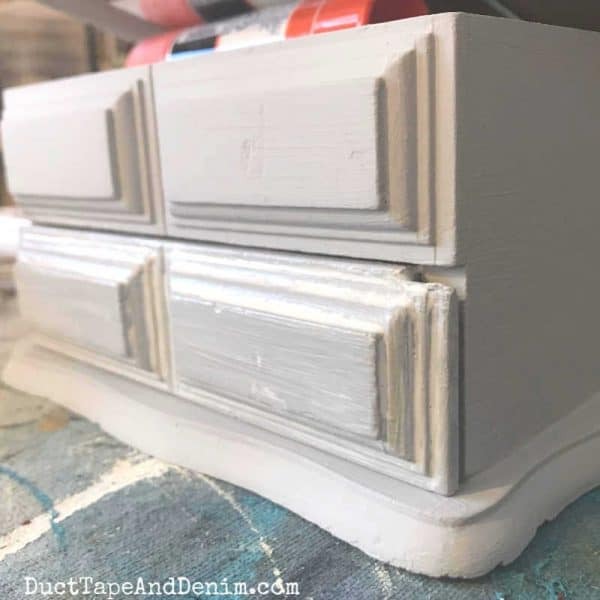 jewelry box handles – Read “Where to Find Jewelry Box Hardware”. On my first paint pour project I painted the body first and then the top. This time I did the paint pour first. Both options worked. Make sure you read about my first project to get all the details. You’ll need a small cup for every color. Mix an equal amount of paint and pouring medium. You may have to adjust this depending on the thickness of the paint. 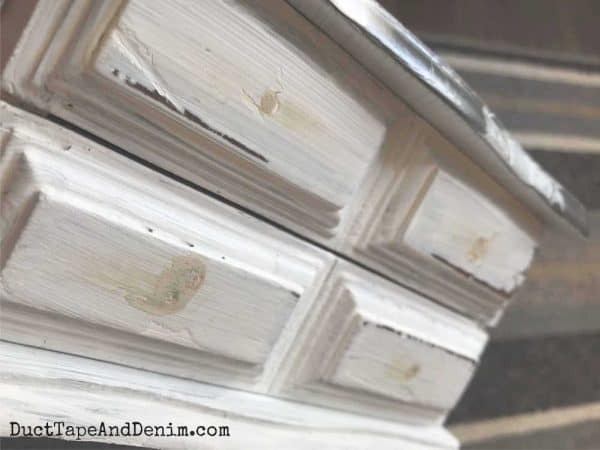 I was using chalky finish paint and a couple of them I’ve had for a while. They were thicker so I added a bit more pouring medium. Just play around with it ’til it pours smoothly. Mix each color individually with a tongue depressor. Next, the part that still terrifies me. Pour all the colors into one big cup! This is called a dirty pour. Here’s a video from the pouring medium manufacturer. I haven’t been able to get a good video of myself doing this… way too messy! 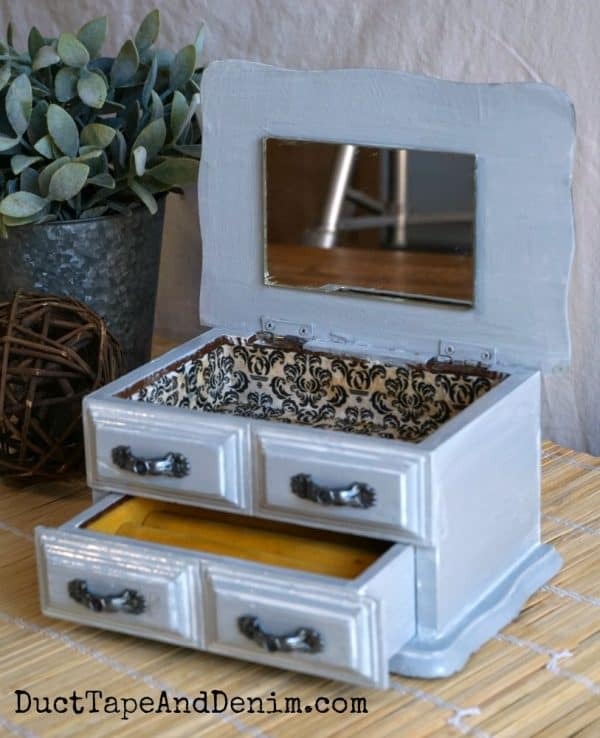 At first, I painted the jewelry box white. But that was too stark of a contrast. The picture below shows where I filled the holes with some wood putty. I was missing one of the knobs and I didn’t have any more that style. So I bought some new handles that looked good on the gray. They were antiqued brass but I used some silver metallic wax on them. 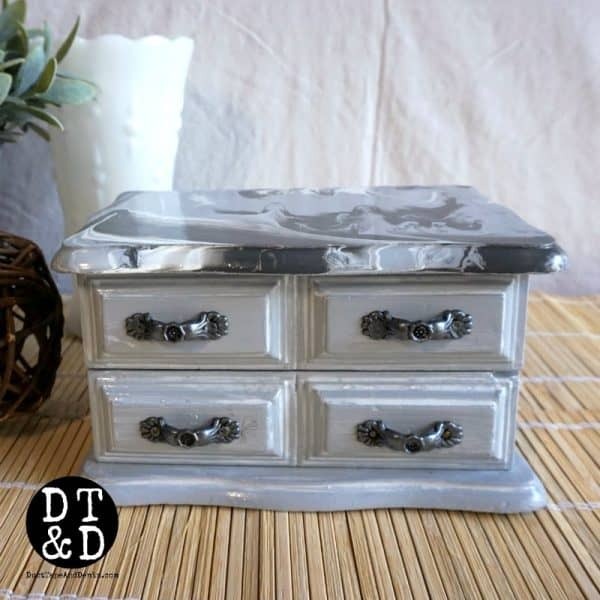 I decided that a light gray matched the top better so I used DecoArt Yesteryear and added a whitewash over it. You can see the difference before and after the whitewash below. The inside had some stains so I decoupaged some tissue paper in it. What do you think? Do you like the monochromatic paint pour or a brighter multi-color one? Thanks for reading! Leave a comment and let me know if you’ve tried paint pouring.